Cities and states across the U.S. have been paying more and more attention to the modernization of the electric grid, and our nation’s capital is no exception. Cost reductions and improved performance of distributed energy resources (DERs) are creating opportunities for the grid to operate more efficiently and at lower costs. Washington, DC is keen to take advantage of these opportunities, and over the past few years the city has been exploring how the buildings and facilities that have been primarily end-users of electricity can actually assist in power management and delivery across the District. “DER” is an umbrella term that can apply to a number of different resources and technologies. It is most often used in reference to rooftop solar panels or customer-sited batteries, the types of 21st-Century tech that have become popular icons of a clean-energy future. Though these resources are valuable and important, DERs can also include less front-of-mind technologies, such as combined heat and power plants, energy efficiency, or even demand response mechanisms. In these ways, buildings themselves can evolve into grid assets, using their own flexible demand itself as a DER. This is one area where DC is uniquely positioned to take the lead. The city has the highest penetration of smart meters in the country; Pepco, the utility serving the District, has installed advanced metering infrastructure (AMI) at nearly 100% of the facilities it serves. These AMI installations not only give Pepco better data on its customers’ energy use, but lays the foundation for using signals from the grid to help buildings manage their use intelligently. In addition, over one-quarter of DC’s electricity demand comes from a single entity – the federal government. If energy use from just this customer became more responsive to grid conditions, it would be a significant resource for Pepco to tap into. To take advantage of these opportunities, DC’s Pubic Services Commission (PSC) opened a new proceeding in June 2015 to identify technologies and policies that could contribute to a cleaner, more intelligent electric grid. The proceeding, named “Modernizing the Energy Delivery System for Increased Sustainability” (MEDSIS), was followed by a series of workshops where different stakeholders discussed adjustments to DC’s regulatory framework that would enable these types of resources to flourish. Participants included utilities such as Pepco and Washington Gas and Light (WGL), community groups like DC Climate Action and DC Sun, and federal government representatives like the General Services Administration (GSA), which manages the 43 million square feet of federal government buildings in the DC metropolitan area. Results from the workshop were included in a MEDSIS staff report released in January 2017. Among other things, the report highlighted the potential for DERs to reduce the cost of operating the electricity grid by reducing peak demand. Meeting peak demand often requires utilities to invest in costly peaker plants and transmission and distribution (“T&D”) system upgrades, so if DERs could help reduce peak demand by providing on-site energy or shifting customers’ electricity use to other periods of the day (or night) it would translate to lower grid systems costs and, by extension, lower rates for customers. Several stakeholders at the workshop commented on the benefits of harnessing flexible demand in this way, including Advanced Energy Group CEO H.G. Chissell, who highlighted New York City’s experience using demand response programs to reduce building energy use when high levels of power demand strained the grid. Unlocking this functionality in DC’s buildings will become easier as those buildings become “smarter.” The U.S. Department of Energy, another stakeholder in attendance at the MEDSIS series, pointed out that a secure communication framework will be key to achieving these sorts of benefits. The more that buildings are able to “talk” to the grid and each other, the more they will be able to operate in concert to deliver demand reductions at appropriate times. Many enterprising DER companies are taking advantage of this, equipping multiple buildings in a single utility’s service territory with on-site batteries so they can reduce their demand simultaneously to deliver greater value to the grid. DC’s high penetration of smart meters will be a boon to the area, not just by providing a platform for buildings to communicate with the grid in real time, but also by providing data that will allow utilities and DER providers to understand where DERs like rooftop solar and on-site batteries will be most valuable to deploy. In the workshops, the GSA suggested that the PSC investigate opportunities to make data available for this purpose. Ultimately, the availability of this data may allow DERs to be used in place of traditional grid investments like new substations and transmission lines. DC is already exploring these types of alternative infrastructure solutions. In February 2018, the PSC instructed Pepco to investigate whether procuring a portfolio of DERs would allow the utility to delay the need to build two new transmission lines in Maryland. Doing so would give the utility more time to monitor area load growth to determine whether the new transmission lines would be necessary, and whether they could be replaced indefinitely through other means. In April, DC’s city government went one step further by proposing the creation of the country’s first independent DER Authority that would be in charge of investigating other proposed T&D upgrades by Pepco to determine whether they could be cost-effectively deferred or replaced by DER deployments. Next month, AEG will be convening stakeholders in DC’s energy sector to explore these topics in more detail. The Q2 Stakeholder Breakfast on Smart Buildings and Grid Modernization will feature representatives from electricity suppliers, city government, and building control systems experts to explore how smart buildings and DERs can be used to reduce costs and improve operations in the power sector. 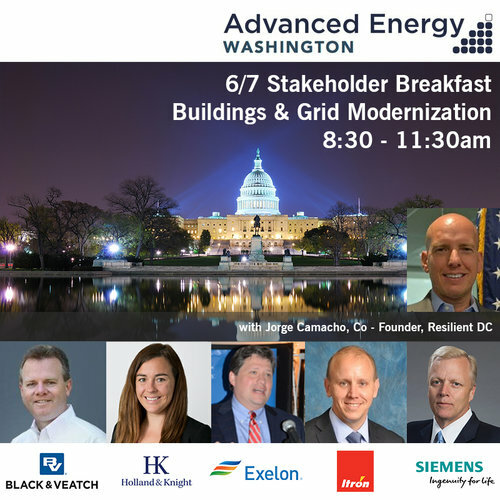 Using DC’s current work on grid modernization as a starting point, the conversation will investigate obstacles to progress and next steps that will allow DC to achieve its goal of a modern and sustainable electricity delivery system. Request an invite now to reserve your seat!